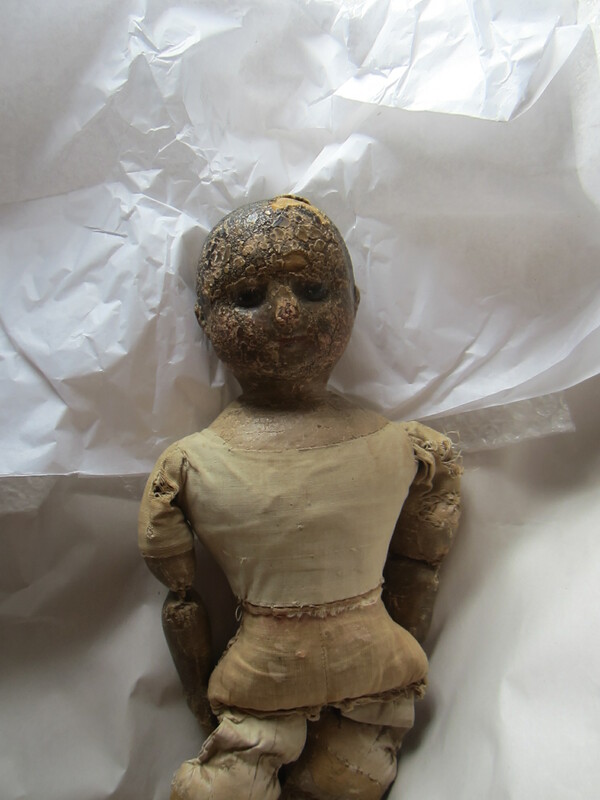 Yesterday this tiny antique Izannah Walker doll joined our household. 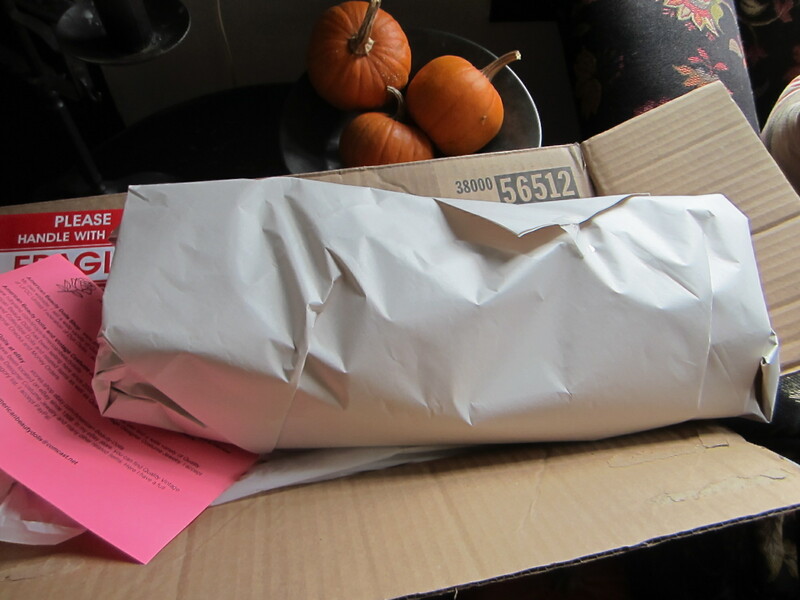 Earlier this week I purchased a small, humble, pre-patent Izannah Walker doll from Nancy Stronczek of American Beauty Dolls and Vintage Costume Jewelry. Coincidentally Nancy and I were both selling dolls at the Jenny Lind Doll Show last Sunday, but Nancy didn’t bring this Izannah to the show. I had no idea that we had even been in the same ball room for eight hours until Nancy pointed it out to me. Which just proves that I really was working and not shopping! A lovely display of vintage jewelery did catch my eye on my one quick circuit of the room and I’m pretty sure that if this tiny Izannah had been there, my internal Izannah radar would have guided me to her. Coincidences aside, I am just happy to have found her at all, and our near meeting in Southbury will simply add one more footnote to the long story of this little doll’s life. As you can see she has been quite an adventuresome girl. Somewhere along the line she lost her arms and legs and had them replaced with Martha Chase limbs. 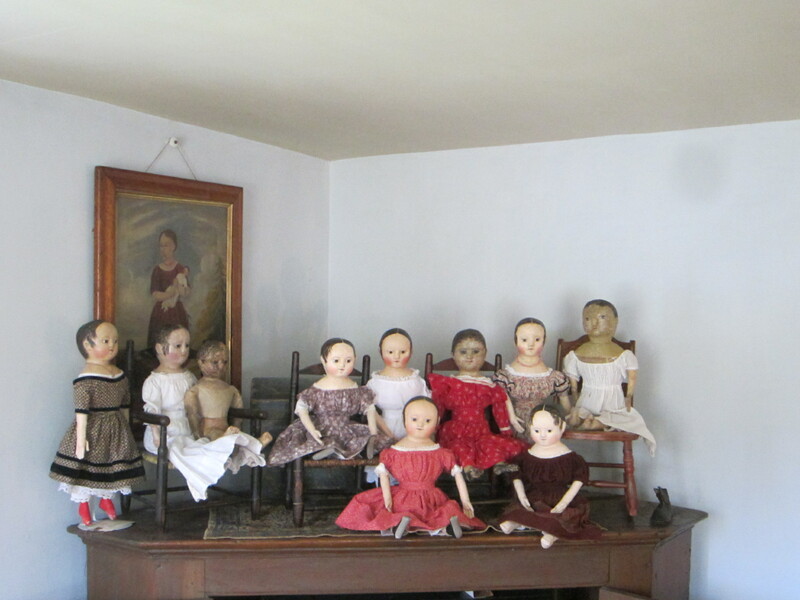 Nancy speculates that this was done at the Martha Chase factory, as they offered “doll hospital” services there. 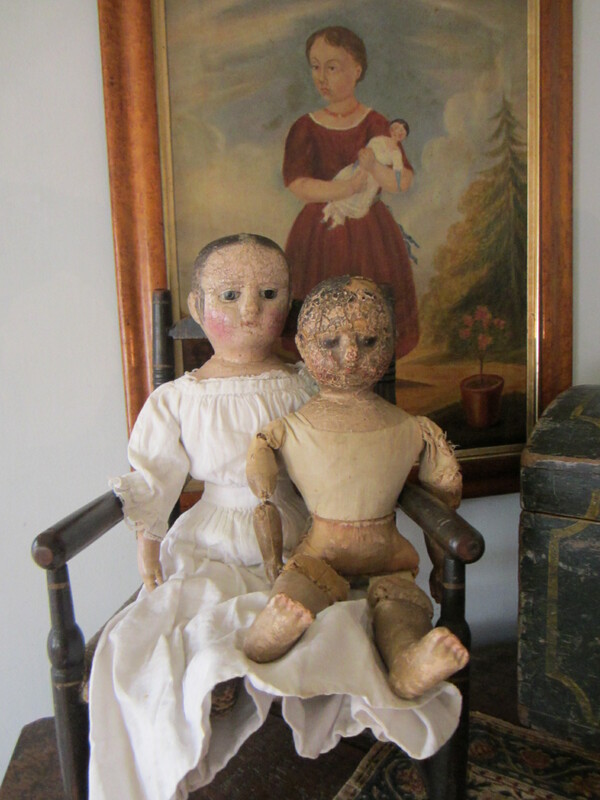 For the past 35-40 years she has been packed away with a group of other dolls to keep her company. 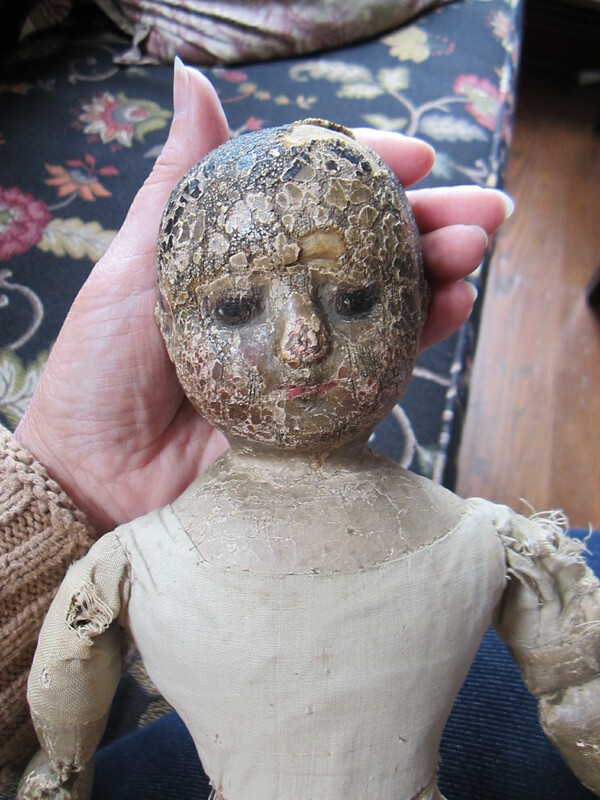 It is very probable that this doll has stayed in New England for her entire lifetime. I just had to buy this doll. I felt like she was asking me to bring her home and take care of her. She needed someone who could look past all of her faults and sincerely love her just for what she is, without wishing she was something better or more beautiful. 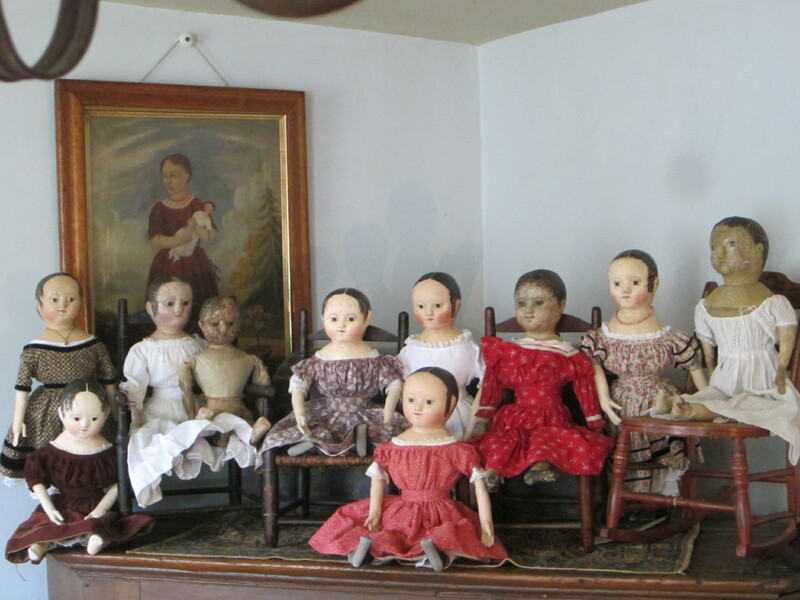 Seventeen years ago I saw another very bedraggled Izannah Walker doll for sale in Brimfield, MA. Most of her paint was gone, she was ripped, torn and grimy and I didn’t care a bit about any of that. My husband Brian was appalled! He simply could not believe that I would even consider paying $395.00 for a doll in that condition (I simply can’t believe she cost so little!). He talked me out of buying that doll, the very first Izannah I had ever seen in person, which I have regretted ever since. In the intervening years times have changed. Yesterday, when he first saw this little doll, he told me “I think you did good”. He is now more in tune with all things Izannah, whether he wants to be or not 🙂 , and the condition and price of this doll did not faze him in the least! Previous Post Two New Dolls Available For Sale – 10/31/13 Update – Both SOLD Thank You! Are you going to make a new mold? So glad you found her! Maybe… She’s in kind of rough shape, so I’m not sure how well it would turn out. This was mostly a rescue mission. My inner curator was yelling at me to do something! As a doll caretaker who tends to bring home dolls who are a little on the rough side myself, I can see why this little girl captured your heart! Her eyes, in your first photo, draw me right into her world. The roughness of her face around her eyes even looks a little like soft eyelashes. 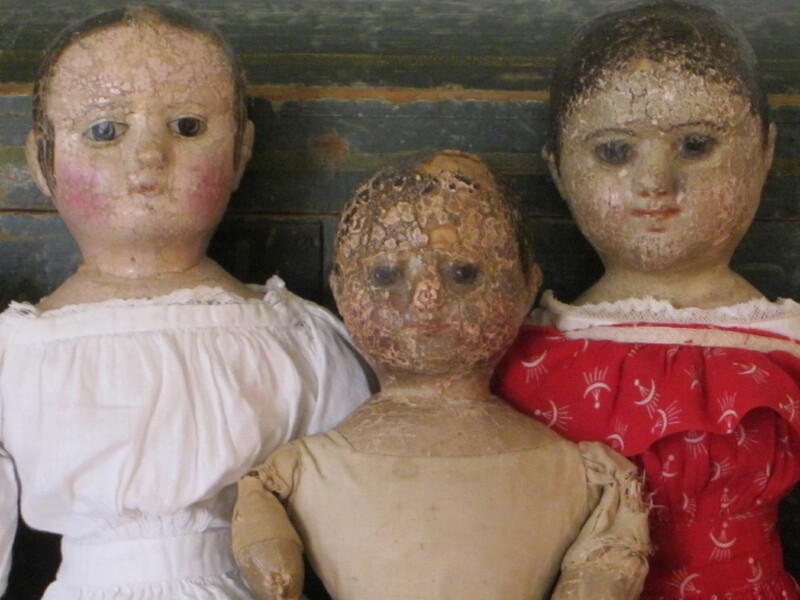 I just adore the old dolls who lack perfection and carry this much character. Such a sweet little sister. Congratulations! Thank you. She doesn’t photograph all that well. I wish you could see her in person! Thank you! I am absolutely smitten! She is so tiny and delicate, underneath all the wear and grime she is a truly wonderful doll at heart. Congratulations Paula on your new Izannah baby. I think she is a sweetheart. She is definitely in the right place, no one will love and protect her more than you will. Thank you Jane. Through it all she has still managed to retain her basic nature and bits of her former glory. I think she was once a VERY nice doll. Hi Paula, your new doll is very sweet, I love her, did you give her a big welcome kiss like I did when I opened my Anna the day she arrived? My husband knew then that I truly adored her at first sight. He knew that he had bought me a doll I truly treasure. Your new Izannah is very fortunate that she got to come and be cared for by you. This reminds me of when I first saw Anna, and her couple of little boo-boo’s how I fell in love with her so fast and never gave it another thought, just bid until I win her. Just to have one Izannah Walker doll. ( I never thought I’d have 2 of them though) is a blessing to me no matter the condition. Our dolls are ours to have and hold forever, aren’t we so lucky to be so blessed. Fondly, Mary G.
We are amazingly lucky and more fortunate than I can say! I didn’t give her a kiss, but did cradle her in my arms. Buying this doll was not something I had planned on. Like my others, she took me by surprise, which makes her all the sweeter. Thank you. Now that she is home I need to discover what her name is. So far she is being shy and hasn’t wanted to tell me what it is. You understand exactly! Sometimes it isn’t logical or practical, you just have to go with your heart and not your head. I think you “did good” too. I’ve always found metal heads endearing. So far I don’t have one, but maybe someday I’ll find one that asks me to bring her home too. I’m so happy that you and Minerva found each other. My nameless little doll doesn’t have any clothes yet either, except for a pair of pantalettes and a sunbonnet. She is going to need a bit more before winter!